Colours can dramatically affect our health, inner harmony and even our emotions. With the help of colour the medical effect can be got which the conventional West medicine cannot receive with traditional approaches. Colour is a living energy. It is a property of light. Light is an electromagnetic energy produced by the sun in different wavelengths. As the light is absorbed and reflected we end up with different colours. Everything in nature is full of colour. Vibration forms everything in life. The universe is only the energy in vibration. Our body has energy fields (called charkas). All of our organs are comprised of vibrating atoms. All of us have our own unique energy system and our organs have different vibrational patterns. We all emit colour. Light has different particles called photons and microwaves. Light penetrates everything, even our bodies. Light also emits wavelengths that we cannot see (ultraviolet). These wavelengths contain radiation, which is energy. Energy is Qi and life. Now it is revealed that the length of a wave defines its colour. In our environment there is an enormous quantity of waves with different frequency characteristics. Moreover, concrete frequency and colour corresponds to each organ. Having the electromagnetic nature the colour cooperates with the energetic structures of a human body, strengthening or suppressing their vibrations. Significant changes in energy structure of the person invariable entail changes at a physical level. Coloured light can be used directly on the body’s health and immuno strength, affecting the body and the emotions. The treatment itself involves the application of coloured light to the acupuncture points on the skin with an instrument that resembles a simple pen light. It does not use needles or pierce the skin. Rather the colour sensitivity of acupuncture receptors on the skin is used to absorb the coloured light. Acupuncture meridians then channel healing information encoded in the light to targeted cells and the brain where it is needed. Every chakra depending on frequency of vibrations prevailing in it has own colour. The aura of the healthy person has pure colours. The mechanism of many illnesses is caused by infringement of colour (electromagnetic) harmony, mixture of colours, and also deficiency of the certain colour necessary for normal activity of the organs and mind-emotional condition of the person. RED — Stimulates brain wave activity, increases heart rate, respirations and blood pressure, excites sexual glands. It energizes the first chakra (coccyx). It warms us and awakens us physically and energizes our blood. It is a good colour to wear when we have colds and poor circulation. Too much red can over stimulate and make some illnesses worse. High blood pressure is an indicator of too much red energy in the body. It is a colour for war, prosperity, fire, and rising sun. Spiritually it is the root colour of fire and connects us to our physical self. ORANGE-– is the colour of joy and wisdom? 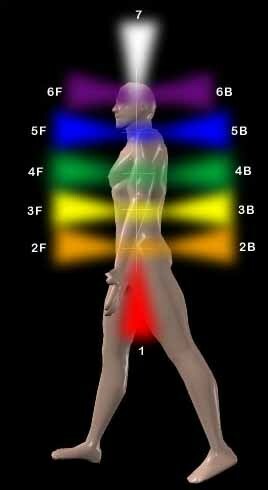 It affects the second chakra (sacral). It gives an energy, stimulates appetite and it is a good colour for illnesses of the colon and digestion. Spiritually it is the colour of joy. It connects us to our emotional self. YELLOW– is the solar plexus chakra. It energizes, relieves depression, improves memory, stimulates appetite and helps in digestive problems. Spiritually it is the colour of wisdom and connects us to our mental self. GREEN– affects the heart chakra. It has a calming effect and balances the nervous system. Green colour is soothing, relaxing mentally as well as physically, helps those suffering from depression, anxiety, nervousness. It is a good colour for cardiac conditions, high blood pressure and ulcers. Since green stimulates growth, it should be avoided in cancers and other tumors. Spiritually it is the colour of love and connects us to perfect love. BLUE– is the colour for the throat chakra. It is a good colour in respiratory illness or throat infections. Blue is calming and cooling to our system and hence, a good colour to counteract hypertension. Spiritually it is the colour of health and connects us to holistic thought. INDIGO– is the colour for healing of the brow chakra. It is a good colour for sinusitis, immunity problems, and all face problems. Too much of this colour can cause depression. Spiritually it is the colour of intuition and connects us to our unconscious self. skeletal system of the body. It is a good colour for improving immunity, cancerous conditions, and arthritis. It also purifies the system and is an excellent colour for headaches and migrains. Spiritually it is the colour of faith and connects us to our spiritual self. You can practice some exercises to heal your chakras. * Balancing the chakras. Take 20Breathings of Prana different colours: red, orange, yellow, green, blue, indigo and violet. Put violet breath for the crown chakra. 5 minutes. The body will absorb these colours and saturate the charkas, in that way the vibrations in your body will be balanced. * With a deep breathing imagine that you breathe air into every part, every organ of your body. This air is transformed then into different frequencies of energy. Inhale slowly though your nostrils and exhale through the mouth. Inhale and exhale to the count of 5. Place the tip of the tongue to the palate of the mouth during breathing. See and feel the air coming in at a certain colour. This exercise can be done for 10 minutes in the morning. * This exercise is used when you feel that some basic colour needs stimulating. Water can be infused with the colour by placing water in coloured glasses and exposing the water for 3 hours to sunlight. The next day drink the water. Water can be also placed in the glass with the coloured paper over it and being exposed to the sunlight for 3 hours. Treatment by colour can be performed on finger meridians, on chakras, painting the certain points by the certain colour following the laws of colours interaction (and consequently, energies) and thus changing the energy potential (balance) both in the point, and in all meridian, and, hence, in organ.